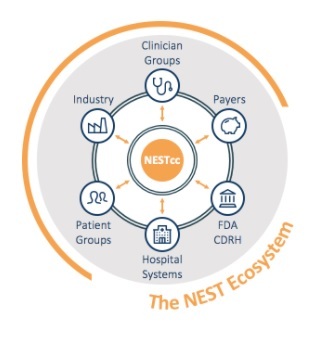 The National Evaluation System for health Technology (NEST) enhances the medical device postmarket surveillance system by better producing evidence for medical device assessment and regulatory decision-making. According to the FDA, NEST “[leverages] real-world evidence and [applies] advanced analytics to data tailored to the unique data needs and innovation cycles of medical devices”. This evidence comes from many sources, including medical bill claims, electronic health records and clinical registries. This system is governed by the NEST Coordinating Center (NESTcc), who will monitor the entire operation. This includes ensuring the compliance and proper standards of the surveillance system. NEST makes it easier for both providers and patients to make improved decisions that align with proper treatment and allows them the freedom to be innovative and make information more accessible.